The Pleasant Bay watershed has been fighting nitrogen pollution for decades. The Massachusetts Department of Environmental Protection (MassDEP) recently issued a unique “watershed permit” to the four towns sharing the Pleasant Bay watershed, Brewster, Chatham, Harwich, and Orleans. With the dramatic increase in Cape Cod development and population during the past several decades, increasing amounts of nitrogen, primarily from septic systems, has been discharged into the Cape’s waterways, polluting local bays and estuaries and choking off once-abundant marine life. This contamination presents serious environmental impacts and has serious potential economic impact on fishing, shell-fishing, tourism, and property values. To address these challenges, in 2015 Baker certified a plan developed by the Cape Cod Commission aimed at both addressing Cape Cod water-quality issues and restoring those waters to levels where they are able to meet state water-quality standards. The plan, known as the 208 Plan, emphasizes local decision-making to determine the best, most cost-effective solutions rather than those that could otherwise be imposed on communities by the state and federal governments. The plan also encourages communities to share treatment systems to reduce costs, and supports innovation and natural solutions where possible. In certifying the plan, Baker directed MassDEP to develop a watershed-based permitting program to provide communities flexibility in their efforts to address water-quality issues. Provide the communities an opportunity to employ a greater range of solutions to address their water-quality needs. The permit covers not just traditional wastewater systems, but also alternative approaches, such as fertilizer reduction, inlet restoration, aquaculture or permeable reactive barriers. Allow communities to get credit for the nitrogen reductions stemming from non-traditional approaches and/or non-traditional technologies, credit they wouldn’t receive through traditional permitting. Account for the need for long-term strategies, such as this 20-year permit, necessary to address wastewater issues. Employ an adaptive management approach, acknowledging the uncertainties that may be associated with some projects, and carefully monitoring performance and assessing progress in a transparent fashion, and if necessary, making changes in the approach that may be needed to achieve water quality goals in a timely manner. The state of Massachusetts also recently awarded more than $3.2 million in funding to support local efforts to proactively plan for and adapt to coastal storm and climate-change impacts, including storm surge, flooding, erosion, and sea-level rise. These Coastal Resilience grants, provided by the Executive Office of Energy and Environmental Affairs Office of Coastal Zone Management (CZM), are being awarded to Braintree, Chatham, Chelsea and Everett, Dennis, the Duxbury Beach Reservation Inc., Gloucester, Hull, Ipswich, Kingston, Marion, Mattapoisett, Nantucket, Provincetown, Salem, Wareham, and Winthrop. CZM’s Coastal Resilience Grant Program provides financial and technical support for innovative local efforts to increase awareness and understanding of climate impacts, plan for changing conditions, redesign vulnerable community facilities and infrastructure, and implement non-structural measures to increase natural storm damage protection, flood and erosion control and community resilience. Grants can be used for planning, public outreach, analysis of shoreline vulnerability, and for design, permitting, construction and monitoring of projects that enhance or create natural resources to provide increased shoreline stabilization and flood control. Chatham: Prioritized Assessment for Coastal Resiliency and Adaptive Management along Chatham’s East-facing Shoreline ($182,122). The town will use tidal, wave, and sediment transport models to quantitatively evaluate the inlet and tidal channel dynamics at Chatham Harbor/Pleasant Bay. The study will support a detailed analysis of potential shoreline management options that could sustain the east-facing Chatham shoreline over the next 20-30 years. Duxbury Beach Reservation Inc.: Duxbury Beach Dune Restoration Project ($500,000). 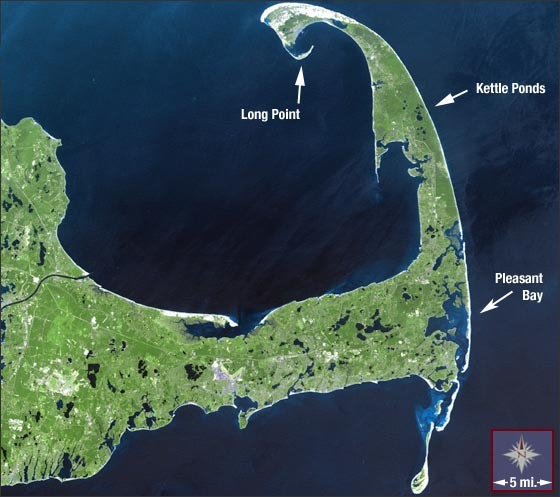 The nonprofit entrusted with preserving a natural recreational beach for the public will build a 3,600-foot-long dune restoration project between the first and second crossovers on Duxbury Beach to improve the resilience of the barrier beach system and provide storm surge and wave protection to the Duxbury Beach access road and the communities of Duxbury and Kingston. Hull: Nature-Based Solutions for Community Resilience on North Nantasket Beach ($142,011). The town will develop conceptual designs to enhance the resiliency and protective value of the coastal beach and dune system on North Nantasket Beach, including both near-term dune rehabilitation strategies and long-term, large-scale beach and dune nourishment. Kingston: Monitoring and Maintenance of a Living Shoreline Project at Gray’s Beach ($50,000). The town will develop and implement a comprehensive monitoring procedure to help ensure the establishment and long-term sustainability of a recently completed salt marsh and dune restoration project at Gray’s Beach Park. Marion: Assessing the Threats from Climate Change to Marion’s Vulnerable Wastewater Pumping Infrastructure ($93,660). The town will evaluate the vulnerability of its wastewater pumping stations and related infrastructure to storm surge and sea level-rise impacts and recommend improvements and future actions to reduce risk to the pumping stations. Mattapoisett: Construction of Mattapoisett’s Potable Water Infrastructure at the Pease’s Point Water Main Crossing ($498,750): The town will relocate an existing water main that traverses an inlet between Pease’s Point and Point Connett to a more landward and deeper location to help ensure that service and water quality will be maintained during storm events and future sea-level rise. Wareham: Installation of Bypass Connection at Cohasset Narrows and Hynes Field Pump Stations ($153,375). The town will install mechanical sewer bypass connections at the Hynes and Cohasset Narrows pump stations to allow the pump stations to immediately continue servicing critical infrastructure facilities in the event of a catastrophic flood event. The town will also prepare design plans for a third bypass connection at the Narrows pump station. Wareham: Resiliency Assessment of Overflow Lagoons at the Wareham Water Pollution Control Facility ($63,750). The town will determine the additional storage capacity needed at the WPCF overflow lagoons for heavy precipitation and peak flow conditions with elevated groundwater due to sea-level rise. The town also will evaluate potential modifications to the lagoons to prevent excessive wastewater discharging into the Agawam River during flood events.